An independent appointment straight out of doctoral training? Really NIH? Wow. The NIH has issued RFA-RM-10-019 which sets out to bypass postdoctoral training and install lucky grantees as faculty straight out of the doctoral award. This FOA issued by the National Institutes of Health, solicits applications for the NIH Director’s Early Independence Award (DP5) from institutions/organizations that propose to appoint and support exceptional, early career scientists directly following the completion of their Ph.D. (or equivalent) or M.D. (or equivalent) training into an independent academic research position, thereby omitting the traditional post-doctoral training period from their career path. Sounds interesting. How about the details? My first concern is size and scope, given the bad NIH history with “starter” awards like the R29/FIRST award and study section cultures that expected an R21 before awarding a fundable R01 score. This DP5 program is full modular R01 size- applicants can request up to $250,000 in direct costs per year for a full 5 years. Schweet! No worries on that score. So who is eligible to be the PI? At the time of application, the Early Independence PI must be within 12 months before or after the completion of their Ph.D. (or equivalent) or M.D. (or equivalent) training. By the end of the award period, the PI is expected to be competitive for continued funding of his/her research program and for a permanent research position. Hmmm, “to be competitive…for a permanent research position”. That sounds a bit dodgy to me. In the part about the application being “required” to demonstrate things, the following are key. Evidence that the Early Independence PI will be appointed into an independent research position…A detailed description of the laboratory space to be provided…career enhancement opportunities available to the Early Independence PI, equivalent to those offered to assistant professors…opportunities for the Early Independence PIs to apply for additional research funding without being required to do so. Soooo. The University has to pony up a non-permanent position that does not have to be at the assistant professorial rank and they have to let the person apply for additional funding. They have to do the usual claim about making space available and that yes, this is an independent position, blah de blah. It’s okay. But c’mon. The NIH is planning on handing out what amounts to an R01 and couldn’t be bothered to hold the University to an Assistant Professor appointment? When they can just deny the person tenure if they don’t like them after the 5yr award interval? 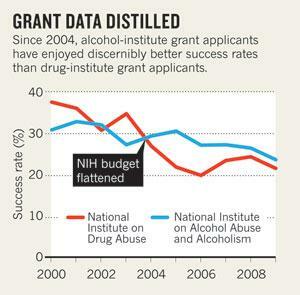 Is NIAAA a better steward of NIH grant monies than is NIDA? Although the alcohol industry is unlikely to relish its legal product being lumped in for study with street drugs such as cocaine and heroin, it has so far remained silent. US Trade groups including the Beer Institute, the Wine Institute, the American Beverage Institute and the Distilled Spirits Council of the United States all declined to comment for this article. I’m still betting their entire strategy (if they actually care about this, which I suspect they do) is going to be by trying to get a pet Congress Critter or two to oppose the plan. Spirited opposition can probably block the whole plan. The second tidbit is contained in a graph of the recent success rates for applicants to the two Institutes. This underlines something that NIAAA people have been quietly bragging about for the past several years. They managed to soften the GreatBudgetCrash blow through 2005-2007, maintaining relatively higher success rates when NIDA’s went in the tanker. The two ICs success rates are closer now, albeit NIAAA applicants enjoy a slight advantage. What does this reflect? Hard to tell from this type of data. Is it better stewardship? That NIAAA Program Staff anticipated the flatlined federal allocation and planned for it better? Important to know as the POs of the two institutes are integrated. Maybe the NIAAA staff deserve a more-equal ranking based on their performance in past years? Is it a reflection that smaller ICs can respond more nimbly? This would seem to be an important analysis to make given the push to consolidate not just NIAAA/NIDA but to merge additional small institutes in the future. Is this only a reflection of a smaller, more insular research community that was more responsive to Program Staff’s warnings not to submit so many proposals? Did the NIAAA’s pronounced bias to put a lot of $$$ into BigMech Centers and the like smooth the process somehow?